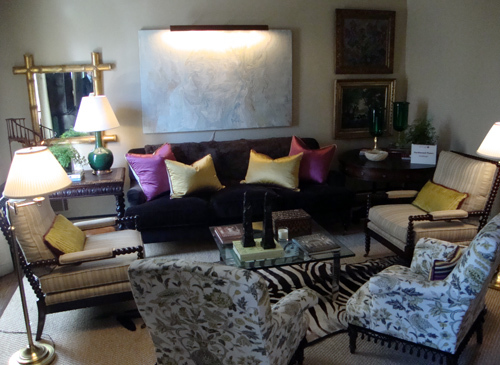 For the first time in the 40-year history of the Cathedral Antiques Show & Tour of Homes, an "Inspiration House" was added to this year's events and activities. Quite honestly, I didn't know about the show until the day before going to tour the Cathedral of St. Philips, the presenter of the Antiques Show. The friend who I'd been planning for a number of weeks to tour the Cathedral with learned of the show and made arrangements for us to attend following our tour of the Cathedral. 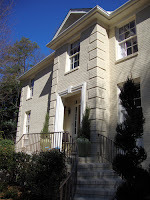 The Inspiration House itself is the Deanery of the Cathedral of St. Philip, on the Cathedral grounds at Peachtree Road and Andrews Drive in Buckhead. As we walked from the Cathedral to the Inspiration House, my friend explained that the House was redesigned by professional interior designers, an individual or team for each of 10 rooms. One of the designers is a friend of my friend and I would meet him momentarily. We arrived at the House and were greeted by Scott Reed, of S. Reed Design, one of the designers who would also serve as our tour guide that afternoon. We were given blue, slip-on "footies," the kind you see worn by engineers in a spacecraft white room or by doctors and nurses in an operating room. The footies, in stark contrast to the beauty we were about to behold, were totally necessary during the weeks of the show to sustain the newness of the redesigned spaces. And foregoing foot fashion so someone can have a beautiful home is an easy sacrifice. The designers selected to participate in the Inspiration House program were challenged to present ideas for decorating and incorporating antiques in the homes of today…thus the official title of the project: The Inspiration House – Antiques for the Modern Home. I'll share with you a little about each of the rooms in the order in which we toured them. The Entry, designed by Laura Green Thome of L. Green Studios, LLC, is welcoming and calming…exactly what you want when coming home from a challenging day at the office, right? The walls are painted with cherry blossoms, which immediately took me back to years of attending the National Cherry Blossom Festival in Washington, D.C., which is without a doubt one of the most beautiful sights in the entire city. 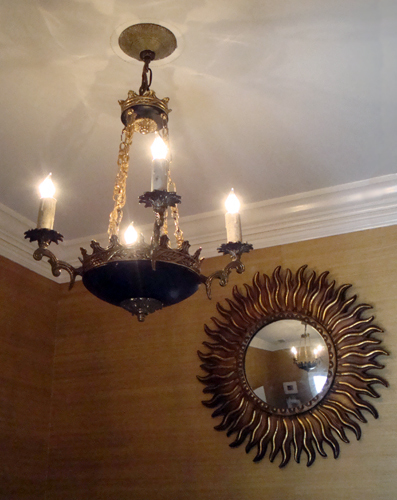 The Passageway & Powder Room was designed by our tour guide, Scott D. Reed of S. Reed Design. The placement of antique mirrors skillfully accentuates the ceiling height of the powder room and the unconventional tweed drapery fabric is a perfect complement to the conjoined spaces. At first glance you're convinced that the sink skirt is silk, of a beautiful steel blue color (one my favorite colors), but Scott advised us that for practicality one should use a faux silk, so that the skirt can be removed and cleaned…excellent advice, thank you, Scott. 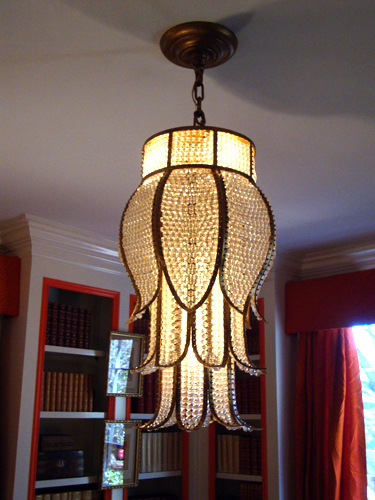 The Library, designed by Marcia Sherrill and Summer Loftin Antiques, incorporates the most surprising color...bright orange! 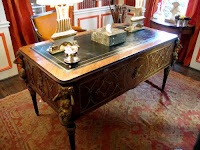 The deep rust, modern drapes are a perfect match and surprisingly worked extremely well with the intricate antique wood desk. 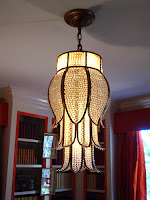 The lotus-esque chandelier is my favorite piece in this room, but the 1920s fashion prints came in at a very close second place. The merger of mid-century and 19th Century furniture in the Keeping Room, designed by Rick Anthony Bonner of bonner llc, is absolutely brilliant. The room was created to give the feeling that all its pieces had been collected over a period of time, refusing to look overly designed. My favorite piece in the Keeping Room is a tie between the four scissor chairs and the grand painting of a horse (I loved horses growing up and grew to love them even more when I worked on a horse ranch during high school in Big Piney, Wyoming). 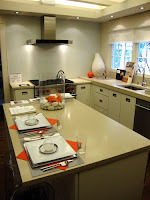 The Kitchen, traditionally connected to the Keeping Room, was designed by HammerSmith, Inc. The Kitchen was a total and complete redesign. Given the Kitchen's relatively modest square footage, the resulting design is simple, yet elegant. The use of stained concrete counter tops and a glass tile backsplash give it a modern feel and the use of orange accents ties it to the other inspiration rooms. The Dining Room, designed by Robert Spiotta and Deadwyler Antiques is spectacular. I was immediately attracted to the fixtures in this room…the chandelier and lamps. Their design is not antique but not overly contemporary either, yet the high shine of the chrome that they're made of totally conveys "modern." At one end of the Dining Room is a grand antique, claw-footed sideboard and at the other end is a four-panel glass and wood window screen (used to diffuse drafts while still allowing light to pass through, prior to the invention of air conditioning). 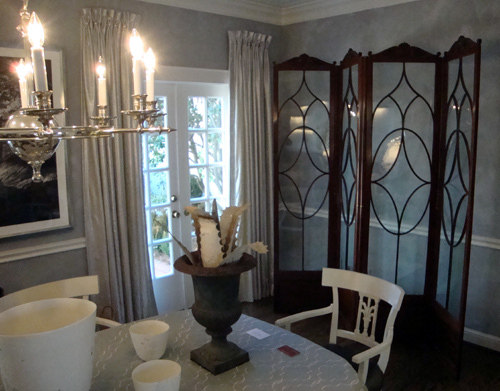 The cloudy silver faux finish on the walls and the side rail molding lend to a formal feel in the space. We had the pleasure of meeting and chatting with the designer of the Living Room, Mary Caroline Mumpower of MCM Interior Design. Mary Caroline's attention to detail is quite impressive. The room's light color is outlined with a deep, dark taupe (just for the record, not being an interior designer, my descriptions of color and such should be considered that of a lay person). That same band of molding is continued at the top of the window valances, but in fabric…a detail so seamless that it would escape the eyes of many. 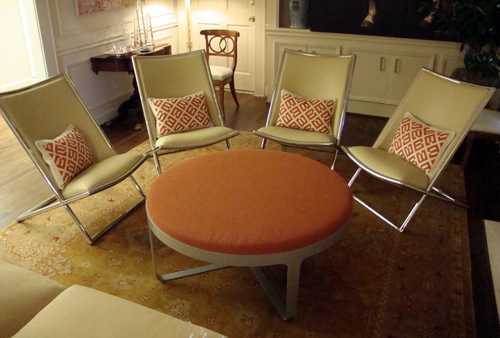 The most conspicuous element in the Living Room is the abundant seating. The modest use of gold and fuchsia highlights bring color and balance to the room's less vibrant floral, animal, and metallic accents. It's an extremely well-done room with clever use of a number of obelisks and lions. 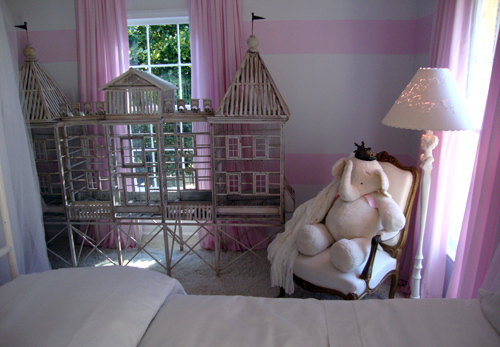 The Bedroom, the only room on the tour that is upstairs, was designed with a young girl in mind, immediately evident by the flowing canopy bed, oversized stuffed elephant, and the lively pink and white color palette. 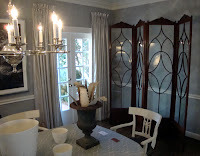 Created by Terry Brown and Terry Vawter of Terry & Terry Interiors, my favorite piece in this room is the gigantic birdcage (I could fit inside comfortably and I'm 6'2"! ), an antique of French origin. It was great to see the designers so excited about their work and a privilege to speak with Mary Caroline and Scott both. Their enthusiasm made you feel like you were there during the design process…coupled with what we were seeing, their narrative really brought the rooms to life. To complete the project, other firms contributed a landscaping redesign and an exterior refresh. From roof to lawn, the Inspiration House does exactly that…it inspires. Will I return to the Cathedral Antiques Show's next Inspiration House? I hope so. There's talk of it becoming an annual attraction. So, I'll be keeping an eye out for next year's announcement and hope for just as much inspiration as I received this year. Hours: Last day is Saturday, February 12, 2011, 10:00 a.m. – 4:00 p.m.
Rick Anthony Bonner's keeping room is a brilliant mastery of coordinated components. Who wouldn't want to enjoy the relaxing environment that he has created? The Inspiration House was one of the best-kept secrets in Atlanta. Hope they do a better job of promoting it next year! 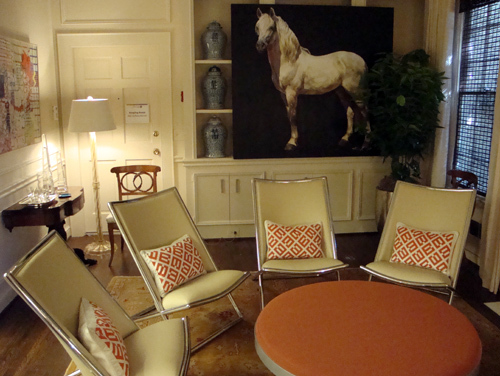 The rooms are creative interpretations of antiques in a contemporary home. While all rooms are worth seeing, the keeping room and dining room are real show stealers. Today (Saturday) is the last day, so come see it while you can. You won't be disappointed!